The fight to reform copyright provides an important reminder: Librarians are powerful activists and educators in the internet health movement. At Mozilla, our mission is keeping the internet healthy—a place where anyone, anywhere, can learn, create, communicate, and collaborate. Why? When the internet is open to and shaped by everyone, it strengthens society. It empowers teachers, students, journalists, activists, and everyday citizens. Mozilla upholds our mission in a few different ways. You may know us best for the web browser Firefox. Firefox is open source, meaning anyone can tweak, build on, and improve the code. Open source code gives way to more innovation and inclusion online. But software alone—even when it’s open source—can’t keep the internet healthy. Nor is it up to just developers to protect the internet. That’s why Mozilla also works in the realms of advocacy and leadership. We help fuel a diverse movement for a healthy internet. It’s a movement made up of technologists, yes, but also activists, artists, educators—and librarians. Librarians have an important role to play in the fight for a robust internet. They are key players when it comes to connecting and empowering local communities online. They seed web literacy and digital skills training, develop curricula that teaches digital skills, and work to ensure their communities remain safe online. Let’s examine a real-world example in which librarians and internet health are deeply entwined. Today, there’s no shortage of threats to the web. Governments and corporations continue to centralize power and access online. Mass surveillance has become routine. And personal privacy and security are eroding. Another danger is bad copyright law in the European Union (EU). Currently, outdated legislation across the continent doesn’t account for life online. Many of the laws governing creating and sharing on the internet were penned several years ago—before smartphones, selfies, and remixing were the norm. In short, current European copyright law is antiquated and restrictive. As a result, things such as education, research, and free expression online suffer. Some libraries in the EU are not allowed to preserve websites, ebooks, online news articles, and other parts of digital heritage due to outdated copyright law. When libraries in the EU buy digital material, the purchase is governed by a contract more than by copyright law. Copyright law should protect the public interest—contracts often protect a private company’s interest. An educator who uses news articles and papers in the classroom may be violating copyright law—there are scarce provisions or exceptions for education. Fortunately, there are opportunities to push back. The European Parliament is currently researching and reviewing an updated copyright framework that has the potential to strengthen, and not undermine, the web. How do we make these reforms a reality? Through public education. And as educators and digital docents, librarians can play an outsized role here. Librarians can use their skill sets—hands-on and community learning—to empower everyday internet users. In the past months, librarians around the world have teamed up with Mozilla to do just this, via Mozilla’s annual Maker Party. 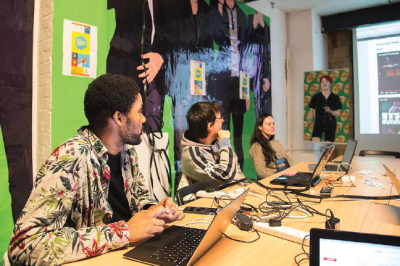 It is a series of global teach-ins and hack-a-thons that teach digital skills. Since Maker Party’s start several years ago, libraries have been our allies. They provide the space, co-develop the curriculum, and provide the educators. Libraries in Stockholm, New York, Toronto, and elsewhere have sparked positive change in their communities. 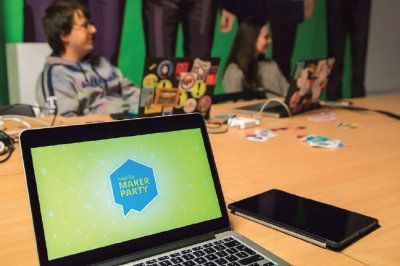 In 2016, our Maker Parties encouraged participants to learn about copyright and its effect on the web as well as advocate for positive reform. Continue to give participants a strong understanding of the proposed copyright laws and explore how they might negatively affect a specific user—for example, a journalist who blogs. Teach learners the importance of Creative Commons and open licensing. Learners might snap, upload, and share their own photos. Spotlight the current errors with copyright law. Learners might create memes of the Eiffel Tower at night—an act that is technically unlawful. Teach learners the value of free, accessible information. Learners can read and edit Wikipedia. Give regular citizens concrete ways to tell their elected member of the European Parliament not to undermine a healthy internet. The fight to reform copyright provides an important reminder: Librarians are powerful activists and educators in the internet health movement. Librarians can stand up as defenders of free expression, open knowledge, and equal access. As new challenges and opportunities emerge beyond copyright, librarians can continue to make a difference. Librarians can educate their communities, spark grassroots action, and can stand up to misguided policy. We’re counting on you to be part of the movement. Join us at mozilla.org. 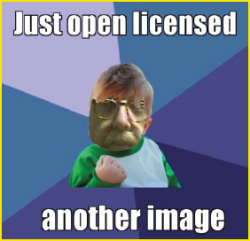 CLOSE UP : A Mozilla Maker Party in Birmingham, U.K.
A participant remixes the Success Kid meme with his own face. A look at one Maker Party—held in Birmingham, U.K.—offers insight into how these events typically unfold. On a Tuesday in November, Open Rights Group Birmingham hosted a diverse crew of activists: open rights advocates, digital artists, and local organizers. The participants set out to teach one another about restrictive copyright law hampering citizens in the European Union and to take grassroots action. The Maker Party started by outlining the raison d’etre: the dangers of restrictive copyright frameworks. Chiefly, the copyright of small text snippets, the aggressive use of automatic content filters, and the failure to exempt panorama and user-generated content from laws. The evening then featured a talk by digital artist Antonio Roberts (@hellocatfood), who spoke eloquently about the intersection of copyright, culture, and free expression. At the center of his talk? Memes and Snoop Dogg. “But there are, unfortunately, people with other interests—corporations and brands will often swoop in and try and stop these things from happening,” he added. Roberts was followed by Wikipedian Andy Mabbett. He spoke about copyright law clashing with the flow of knowledge—for example, some photos of public landmarks can’t be added to Wikipedia entries. The Maker Party concluded with a series of hands-on activities—such as openly licensing photos and crafting and sharing rebellious memes. Read a blog about this Maker Party, and see the memes that were created, at openrightsgroupbirmingham.wordpress.com/2016/11/26/org-birmingham-mozilla-maker-party-helps-fix-copyright-meme. Mozilla Maker Party in Birmingham, U.K.
[Photo Credit: Francisclarke (CC BY-SA 4.0), via Wikimedia Commons] A group of guests sitting around a table taking part in a Mozilla Maker Party in Birmingham, U.K.
Melissa Romaine (melissa@mozillafoundation.org) is the advocacy network manager at Mozilla. She works closely with librarians, technologists, activists, and policymakers to build an active global movement to fight for a healthy internet.